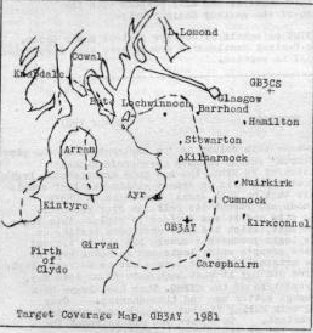 Following on the success of GB3CS a repeater to cover Ayrshire was mooted for in the mid to late 70�s with tests being carried out in the Autumn of 78. However it wasn�t till 1981 that the repeater was licensed. Initially it was somewhat autonomous from the CSMFG in that it had its own technical support, administration and fund raising activities. But relied upon the Group to provide a higher level of back-up and design. Relating to Issue 37 of the NEWS and the article by GM3THI of the Ayr Club - who worked along with the CSFMG to get AY-MkI on the air. 1981 �.. On Saturday 2nd May 1981 the Ayrshire repeater GB3AY was finally housed in the other users room of the IBA station at Lethanhill near Patna in Ayrshire. The repeater uses channel R2 and the map below shows the minimum target area. �� The site at Lethanhill is owned by the IBA and has been is use since 1969 as a television relay site boosting STV programmes to an area similar to that covered by the amateur repeater. �� on the 16th of May the aerials which had been temporarily erected on the South West leg of the mast were re sited to their final position on the North West leg. The receive aerial is at 90ft and the transmit aerial at 50ft. Both are single straight dipoles. The rising of the aerials to the new height increased signal strength by up to 4 �S� points at some locations. Clydeside and Ayrshire both appear to have good coverage and several GI stations have been enjoying the availability of the new repeater. 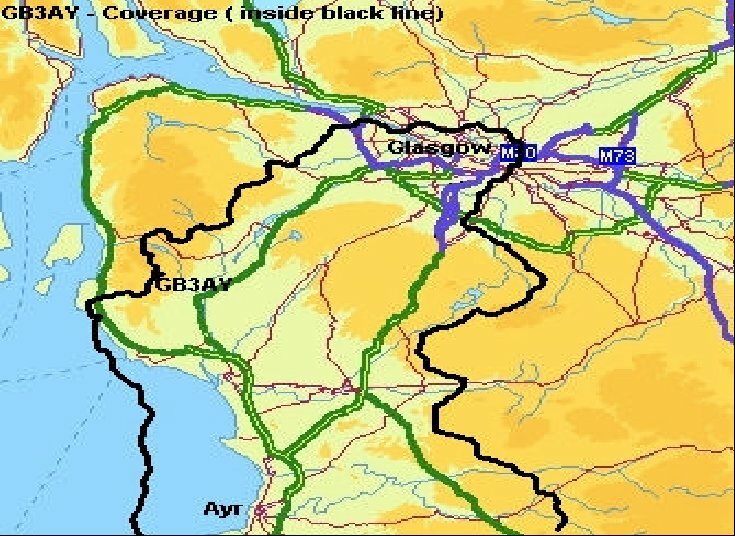 As it turned out this coverage map was somewhat optimistic with on-going complaints coming from north Ayrshire and poor coverage of the A71 from Lanarkshire and the northern section of the A77. �� Whilst many individuals have helped out, perhaps a mention should be made to Tom, GM4DOZ who built the logic and power supplies and re-housed the transceiver �.. Jack GM3KJF being the CSFMG Committee representative, always seemed to be in the thick of things��.we must not overlook the IBA boys, GM3KMG and GM8LBC�and their colleagues for the work they have put in on behalf of the CSFMG and the Ayrshire repeater�.. Although the repeater provided sterling service around the southern parts of Ayrshire there was continuing disquiet from amateurs in North where the main population is located. 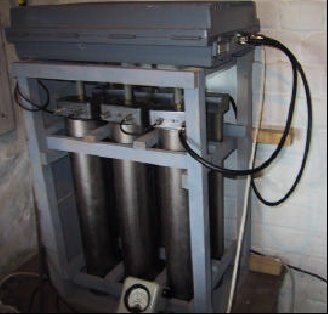 By this time the repeater had come fully under the wing of the CSFMG and it was decided to relocate the repeater to an abandoned TV repeater site which had been used to fill-in the Darvel valley. Referring to Issue 65 of the NEWS. 1988 �. On the 2nd of February site tests where carried out from a site near Galston in Ayrshire with a view to finding a replacement site for the under used repeater GB3AY�. even activity was dropping off then! �. The answer came from an offer to use an old subscriber relay mast just outside the town of Galston. The building and mast had been unused for years, but with some repairs and a good lick of paint it seemed a like a godsend �.. It wasn�t just a case of a few repairs! 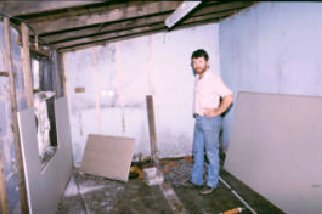 As the buildings roof had been leaking, the roof and the floorboards had to be replaced along with the plasterboard on the walls. Members of Ayrshire Raynet came to the fore by refurbishing the site on the Groups behalf. Unlike the hut the 30M galvanised mast was in good condition but all the old TV hardware had to be removed before we could install the aerial and feeders. The aerial consisted of a refurbished Andrews commercial hi-gain collinear (ex 3CS at Blackhill now in use at 3PA) with LDF550 feeder. GB3AY-MkII. So in early 1989 saw the next incarnation of AY become operational from the new site. The equipment consisted of the old CS-MkII equipment based on a Storno 612 and 3SAN discrete logic which had been out of service and replaced by CS-MKIII. 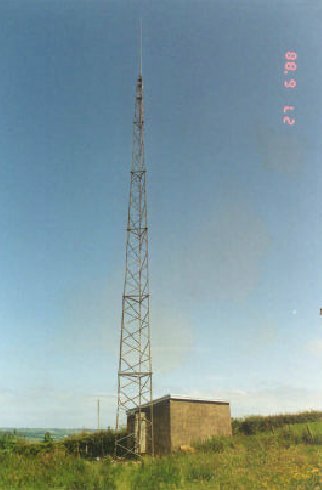 To allow the repeater to use single aerial working one of the new new CSFMG designed duplexers was pressed into service. GB3AY-MkIII. In early 1991 AY came into line with the rest of our 145MHz repeaters CS, FF and PA with the installation of a 6502 based logic unit. 1994� However all was not to go well with the site. With the onslaught of cellular radio an offer was made to the farmer who owned the site and we were duly asked to relocate ASAP. �.working in close contact with GM0OPS and GM4CXM from the DX Cluster group GB3AY�S new home began to take shape�as I am writing this I am listening to two stations, one from Stranraer talking to a station in Edinburgh�.proof of a job well done�. And there it remains to the present � we hope! Ident � �GB3AY� in morse every 6 mins if not in use or 12 mins if in use. Access � 1750 for greater than 0.5secs but no greater than 4 secs . No CTCSS at present.